By Rachel Held Evans, on December 19, 2014. Today I'm thrilled to share a guest post about parenting, pluralism, and the holidays from the witty and wise Amy Julia Becker. Amy Julia is a columnist and blogger and the author of Small Talk: Learning from my Children about What Matters Most. What I love about Amy Julia's work is that it is always carefully-considered, balanced and insightful. Even when wading into controversial territory, Amy Julia consistently exhibits patience and grace. I hope you appreciate this post as much as I did. 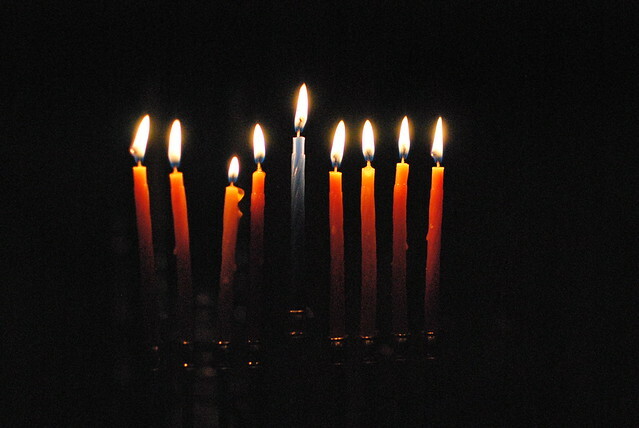 “Should I put an x through Hanukkah on our calendar?” our six-year old son William asked when we turned the page to December. If there’s one thing I’ve learned over this past decade of parenting, it’s that questions about religion demand my attention, and all the more so if they inadvertently reference a history of discrimination. William has learned a little about racial discrimination through Martin Luther King Day and conversations we’ve had about our complicated national history around the Fourth of July. But the idea that people kill each other in the name of God? We haven’t gotten there yet. Still, his words—intended as a simple statement of fact about the different holidays celebrated among his friends—bring me back to high school history classes, learning how Christians persecuted Jews for centuries. His words bring me back to the first time my mother told me about the Holocaust, and how I wanted her to stop the car so I could escape from the knowledge of such horror. His words remind me of the passive acquiescence of clubs and schools and communities that denied entrance to those without Protestant qualifications. When we turn the calendar to December, I’m usually looking for ways to teach my children about the religious underpinnings of Christmas. For them, it all blends together in a happy conglomeration of presents and carols and lights and cookies and nativity scenes, and I try to make sure that the story of a baby born in Bethlehem as a gift to the world doesn’t get completely overshadowed by “Jingle Bell Rock” and Santa and Home Alone. I even try to connect the two—the secular celebration and the spiritual message that God cares enough about our everyday lives, including the food we eat and the clothes we wear and the fun we experience, to enter into it in the form of a child. I had been expecting questions about Christmas. But I hadn’t been thinking about Hanukkah at all. William’s simple statement made me realize I haven’t talked much about other religions with our children, and the particularities of our Christian practice flare up when I think about William comparing himself to Noah and Sarah. In this season, I want to affirm what we believe about Jesus. I want to introduce my kids to a God who is both personal and public, a God who hears their prayers about being afraid to go down the slide at school and who also cares about the systems of injustice and oppression in this world. And even as I uphold this peculiar and particular faith, I want to teach William to engage his friends and teachers with different faith backgrounds and commitments with deep respect. I choose pluralism, with some measure of fear and trembling. The only way I will teach my children not to repeat the abuses of the past is if I live out our faith as a way of humble, sacrificial love. The only way Christianity is good news for the world is if Christians live the Christmas message all year round—this message of a baby born in a stable, this message of peace, and hope, and joy. A week later, I sat in the audience at William’s school’s winter concert. He and his friends sang an old Shaker carol about the lamb. They offered an African-American spiritual about Emmanuel. They sang a Hannukah song with a Jewish student reading a history of the holiday. They performed a fun and silly round, complete with hand motions, inviting the light to come in during winter. It was a celebration of tradition, history, music, and religious diversity. The music honored each tradition without pretending they were all the same. For a moment at least, we were celebrating all together. I’m glad we celebrate Christmas. And I’m glad Hanukkah shows up on our calendar. If you enjoyed this post, be sure to check out Small Talk: Learning from my Children about What Matters Most. In Small Talk, Amy Julia draws from the wisdom and curiosity of those young voices to reflect on beauty and kindness, tragedy and disability, prayer and miracles. As she moves through the basic questions her kids posed when they were very young to the more intellectual questions of later childhood she invites us to learn from our own day-to-day conversations with the children in our lives. You can also find Amy Julia on Twitter, Facebook, and her blog.